Chauffeur driven vintage Rolls Royce wedding car hire in Southampton, Portsmouth, Winchester etc. 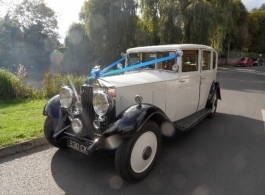 This 1934 Rolls Royce is a fantastic wedding car that both the bride and groom will love and as it is a Limousine model with extra legroom there is lots of space for a large wedding dress. For a pair of vintage Rolls Royce's please also see vehicle code 0014. Thank you for contacting First Choice Wedding Cars. We shall be in touch very soon. Please note: A booking is only secured once a deposit payment has been made.